Miami (Oct. 6, 2014) — Banana Coast, the newest cruise port in the western Caribbean, is preparing to host its first mega cruise ship call at the deep-water Bay of Trujillo, Honduras. 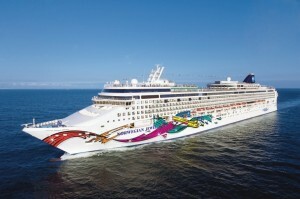 Norwegian Cruise Line’s 2,376-passenger Norwegian Jewel is scheduled to arrive Oct. 15, 2014, launching the port’s inaugural cruise season with the first of 29 calls. The port is planning a ribbon-cutting ceremony that is slated to include government and community leaders from around the region. Invitees include Honduran President Juan Orlando Hernández; Vice President Ricardo Alvarez; ministers of tourism, environmental and natural resources, economic development, national security and national ports; and local mayors and government officials. A traditional plaque exchange between representatives of the port and Captain Sven Kenneth Harstrom, master of Norwegian Jewel, is planned. Also representing Norwegian Cruise Line will be Bjorn-Ove Hansen, director of nautical operations. As guests disembark tenders they will be greeted by local Garifuna musicians — dancers and performers in colorful attire. Establishments at the visitor center include a Jade Museum and jewelry shop, CocoLoco’s organic frozen coconuts, a duty-free liquor and gift shop, and a variety of kiosks offering refreshments and souvenirs. To welcome cruise guests the community has erected bilingual signs, and personal Spanish-English translators will be on hand at the port to facilitate communication. Banana Coast Tours offers 15 tours that include snorkeling, kayaking, waterfall explorations, horseback riding, beach breaks, nature expeditions, mangrove boat rides, jungle ATV adventures, and a variety of other cultural, historical and gastronomic excursions. Six cruise lines have scheduled a total of 29 calls on eight ships at Banana Coast during the 2014-2015 winter Caribbean cruise season. Holland America Line was the first major cruise company to commit to a series of calls from November 2014 through March 2015. In addition to Norwegian Cruise Line and Holland America, Silversea Cruises has slated calls in December 2014 and March 2015, and P&O Cruises and Oceania Cruises plan to call in the first quarter of 2015. The people of Trujillo were very warm and welcoming. There was a noted police presence and we never felt uncomfortable. Everyone seemed very happy to have us visiting their country and almost all waved and met us with smiles. The dancers were very colorful and energetic, inviting anyone who wanted to join in their dancing! It was a pleasure to experience the atmosphere created by the townspeople of hospitality and artistic expression, in their art and culture. Thank You for welcoming the first cruise ship with open arms people of Trujillo, Honduras. We especially enjoyed the carving of Henry Medina in cedar wood, and the dancers in the taste of Trujillo excursion.